Sceletus Triceratopis horridi in Museo Historico Naturali Angelopolis Comitatus. Haec species vivebat in periodo Cretaceo superio Aevi Cretacei. 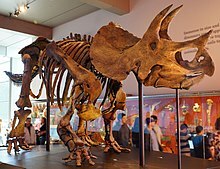 Triceratops (a Graeco, τρι- 'tres' + κέρας 'cornu' + ὤψ 'oculus, facies') (nomen a Marsh anno 1889 factum) est genus dinosaurorum herbivororum quod Aevo Cretaceo exeunte vixit. Reliquiae in America Septentrionali inveniuntur. Anno 2010 Scannella et Homer proposuerunt Triceratopem eundem ac Torosaurum esse; haec sententia etiamnunc disputatur. ↑ Vocabulum fortasse sicut cyclops declinandum: Triceratōps, -ōpis, m.; acc. -ōpem vel -ōpa. ↑ The American Heritage Dictionary, s.v. "Triceratops." Scannella, J.B. et Horner, J.R. 2010. "Torosaurus Marsh, 1891, is Triceratops Marsh, 1889 (Ceratopsidae: Chasmosaurinae): synonymy through ontogeny." Journal of Vertebrate Paleontology 3(4): 1157–1168. doi:10.1080/02724634.2010.483632. Longrich, N. R.; Field, D. J. 2012. "Torosaurus is not Triceratops: ontogeny in chasmosaurine ceratopsids as a case study in dinosaur taxonomy." PLoS One 7(2): e32623. doi:10.1371/journal.pone.0032623. Vicimedia Communia plura habent quae ad Triceratopem spectant. Novissima mutatio die 6 Aprilis 2017 hora 19:16 facta.